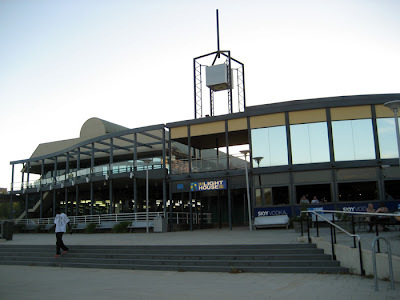 The Lighthouse Bar is a typical pub, with nice views of Lake Ginnindera. 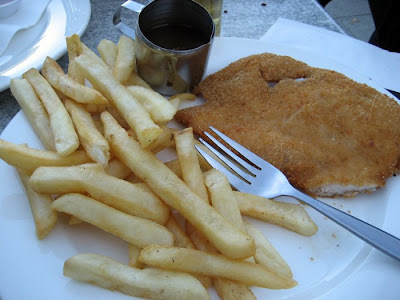 Schnitzel and chips with mushroom sauce. 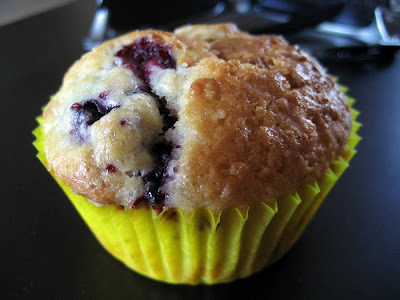 A blackberry muffin we made at An's house, using those awesome blackberries we got at the Capital Region Farmers Market. We bought a muffin tin and papers while we were up there, because An didn't have any. Apparently he has now become quite the enthusiastic muffin baker! 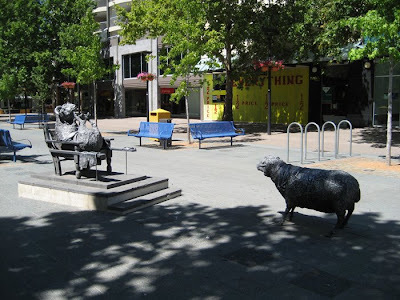 In the Canberra city centre there are quite a few interesting artworks, including the cutlery drain thingo (not the official term, I'm sure) at the top of this post, and these sheep sculptures. 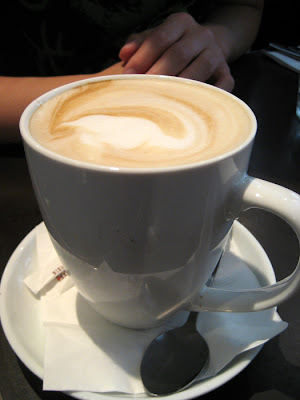 City centre is also home to Milk & Honey, a trendy and modern cafe, where we went for breakfast. It felt very "Sydney" to me. As a huge bonus, it was open on Sunday mornings! Yay! 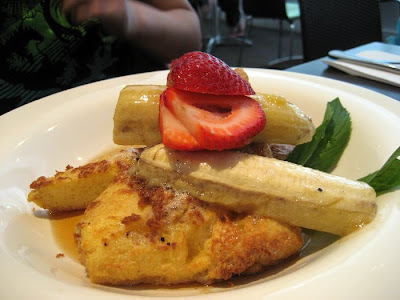 French toast served with grilled banana and maple syrup - $10. This was outrageously good. I normally hate French toast, but these were light and fluffy and just gorgeous. I (unwittingly) ordered the no-carb option. This was tasty, but a bit rich for me. 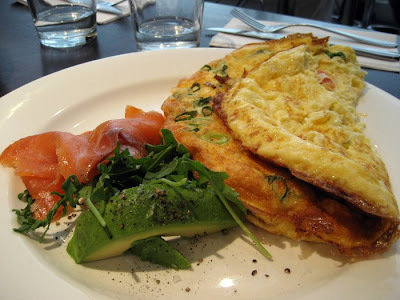 I would have rather had an omelette half the size, with some toast on the side. Sandra went classic, with some poached eggs on toast. 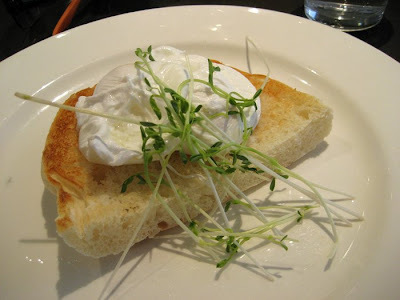 Organic free range eggs scrambled, fried or poached eggs [sic] on toast - $9.50. It's freezing outside. Half my family have colds (including me *cough cough*). Time for proper comfort food. First up we have a reprise of Nigella's baked veal and ham pasta, first made over 3 years ago as my 300th recipe for my How to Eat project. Cooked penne, white sauce, cooked carrot/onion/celery/minced veal/pancetta. All mixed together, sprinkled with parmesan cheese and baked. Oh Yum! Earlier this week I made a sausage and bean casserole, from the Comfort chapter of Joanna Weinberg's How to Feed your Friends with Relish. You start by boiling some large cabbage leaves until floppy (interesting fact: I really like the smell of boiled cabbage! ), then drain them, and wrap them around "excellent pork sausages", which will need to be skinned first. I used hot Italian pork sausages from my local organic/biodynamic butcher. Then you cook some onion/carrot/celery in a pan - the recipe calls for pancetta but I'd already blown the budget on the organic sausages - add the parcels, stock and tinned tomatoes, and simmer for 25 minutes. You add some beans at the end and let them heat through. This was gorgeous. It's very different from what we'd normally eat at home, and delicious. I served it with buttery mashed potatoes (again, incidentally, organic ones from Vic Market). The flavour relies totally on the quality of the sausages, so it makes sense to get good quality, spicy ones. I previously mentioned how much I enjoyed the April 09 edition of Gourmet Traveller. One of the reasons for this was a small feature on Wiener Schnitzel, which inspired me to make some for dinner last week. I did a mish-mash of the Gourmet Traveller recipe and the one from Neil Perry's Good Food. I also made my own mayo to go with, and served it as a condiment, rather than mixing it through the coleslaw, as I thought it might make the whole meal a bit too rich. After much swearing and getting half the equipment in my kitchen greasy and feral, I realised the easiest way to make mayonnaise is the old fashioned way - a bowl and a whisk. Coleslaw, simply dressed with red wine vinegar and olive oil. Bratkartoffeln. This is something I learned how to make in Germany. You boil some potatoes, then peel and slice them, and cook them in a pan with onions and speck until crispy. There is nothing about it I don't like. And the schnitzel! Not nearly as good as Figelmüller's iconic schnitzel, but still good enough to make us happy on a cold night. The Flower Drum needs no introduction, and we were all very excited to be going there for my Dad's birthday last week. Before this visit, I'd been to Flower Drum once in my life - my family was very graciously taken there by my school friend's Mum (thanks Mrs D!) back in year 8. I was only 13, but I knew it was a Big Deal. Unlike most Chinese restaurants I'd been to before, it was quiet and spacious, you had to take a lift to get to the dining room, and every time you moved there was a waiter to fold your napkin, change your plate, refill your tea and so on. Doesn't seem like too much has changed since then - the decor is still (very) old-school, and all the staff were lovely and very professional. (Unlike certain *ahem* other places we've been to recently). The food is pretty much what you could order at any suburban Chinese restaurant, just done much better and fresher. (Think - classic, not cliché.) Even the tea seemed more fragrant. We eschewed the banquets in favour of ordering a la carte (yes, it was a birthday, but we didn't want to totally blow the budget), and our waiter was very knowledgeable and helpful in his recommendations. We also ordered a bottle of Wynn's Coonawarra cabernet sauvignon (I forget the year), which is one of my dad's favourite reds. Just one bottle of wine was enough for the 6 of us - we're Asian, we don't drink that much, hehe. I was hoping we'd get suckling pig, but we learnt that you have to order a day in advance. Ah wells, we had to satisfy ourselves with Peking duck. Wonderful! The pancakes were easily the best I've ever had, and the duck was moist and tender, albeit a bit meatier than what I'm used to. The waiters then cleared away the centrepiece (see above) and replaced it with a lazy Susan... and our food. Noodles are de rigeur for any Chinese birthday dinner. Normally, (shh, don't tell anyone), I hate E-Fu noodles, finding them bland and soggy. But these noodles were amazing - they had a great texture and were so fresh and full of flavour. My bro loves Cantonese beef, and on the recommendation of our waiter tried a different, slightly spicier, sauce. The beef itself was great, but cooked a bit too rare for some at our table. For my tastes, however, it was perfect. (It's no secret how I love a bloody steak). Yummm! These prawns were scaldingly hot, fresh out of the oil. Impressively, the prawns were the big meaty type, not the smaller rubbery type I'm used to getting at Chinese restaurants. When we ordered this one, our waiter informed us that it would be similar in flavour to the prawns. As one of our group doesn't eat seafood, and we all love spicy salt, we ordered it anyway. It's good to get thoughtful service like that. When the chicken arrived, we were surprised that it didn't come with the usual little bowl of spicy salt for dipping. However, once we started eating the chicken, we realised we didn't need it, as the meat itself was infused with the flavour. Came with fresh strawberry purée, a nice touch. They also gave us some almond cookies for the end of the meal. They were less sweet than I expected, and had a short, flaky texture. Lovely! When they brought the biscuits, my dad said, "Wow, this is even better than dessert!" (We are big biscuit eaters). A little bit later, our waiter returned with a small container of more the same yummy biscuits in a cute little Flower Drum paper bag for my dad, saying he noticed he liked them, that they're good with tea and he hoped we'd enjoy them. How sweet! (I still have the bag at home, and am tempted to use it to carry my lunch to work, heheh). Considering its pricy reputation, it wasn't too expensive overall - for the 6 of us, the bill came to about $500. However, it'd be very easy to blow the budget if you went nuts with wine, seafood, shark-fin soup etc. Service is excellent, food is great. Nothing else to say. Love it. I wanted to choose a restaurant that was good, but that wasn't too hot-off-the-press new and popular, or one that we'd been to a million times (sorry Tutto Bene). I'd heard good things about Paul Wilson's food, and my dad had been wanting to try it forever, so I chose The Botanical. Checking out the online menu, I'd already decided on the incredible-sounding: "450 gram dry aged, 200 day grain fed, Stockyard QLD select Angus entrecote steak served on the bone with truffled butter & twice cooked chips". I know, doesn't it sound amazing? That, plus Will Studd's cheese platter, would have been the perfect birthday meal. But alas, when we got there, we were told it wasn't on the menu that night. Cue cries of pain and disappointment (in my head). Luckily, the cheese platter was still on the menu. But more on that later. There were a couple of little problems with the service - nothing huge, but enough for us to notice. For example, while we were waiting for the rest of our table to arrive, we didn't get shown a wine list or have our drinks order taken. Later in the evening we were given poor explanations about the food, and so on. Let's move to a more positive note - the food! After everyone came and we placed our order, we got some fantastic bread (and refills when we finished it, yay). Warm bread - crusty on the outside, soft and fluffy in the middle. Only my mum and dad got entrees, while the rest of us went for mains/dessert. The entrees seemed quite tiny, but they were both very impressed with the quality. That salad, in particular, was great, and my dad loved it. After trying a tiny bite, I wish I'd ordered that myself! The combination of textures and flavours was just lovely. After seeing those delicious entrees, we were all eagerly anticipating our mains. Overall, however, we were a bit disappointed. Not because they were bad per se, but they seemed to lack the balance and delightful flavour-combinations of the entrees. That, and they were absolutely massive, leaving us gasping for air. The salad was delicious, as was the butter, but I wasn't particularly impressed by the steak. It was very tough (which is probably the way it's supposed to be, considering the waitress described it to me as "textural")... but it was a mistake for me to order it rare, as this made it even more difficult to cut. What is the point of a massive steak knife if it isn't even sharp? I'm not posting photos of the other mains, mainly because it was dark in there and I couldn't get clear photos of them all. And we all ordered meat, so all the pictures looked quite similar. The general response from my family was that the mains tasted nice, but were too big to be eaten comfortably. With our mains, we also ordered a butter-leaf lettuce salad, a serve of fries, and the "Thrice cooked hand cut chips with Provencale salt & aioli". This was to share between 6 of us, so we thought it would be an appropriate amount. What we didn't realise (i.e. what wasn't written on the menu and what our waitress didn't tell us), was that 2 of our steaks already came with fries... and despite all evidence to the contrary, I am not the Gobbledok and we couldn't even get through half of them. 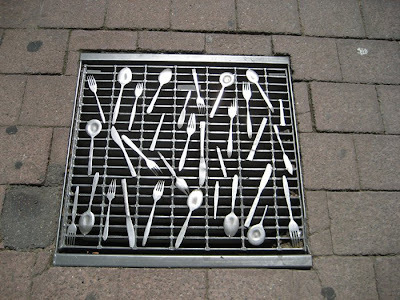 What a waste! I wouldn't go as far as Ed to say that Maccas chips are better, but they definitely weren't as good as the ones at Bistro Guillaume. For desserts, my brother ordered the Will Studd cheese platter, Su got a grown-up sized prune & armagnac souffle, and Sandra and I shared the dessert selection (picture at the top of the post), as we couldn't decide. Best. Cheese. Platter. Ever! It proved too big for my bro to eat on his own, so the rest of us (mainly me, heh) had to help him out. Some of you may remember the cheeses that Ed brought to the latest Bloggers' Banquet (kindly donated by Will Studd). They were beautiful, so I knew this cheese platter would be quality. And they even topped up our bread and crackers when we asked. Clockwise from left: Munster (washed rind); Roquefort, Sevre et Belle Chevrot (goat's) and Cantal Entre-deux (firm cow's milk cheese). The dessert selection was good value - generously sized and gorgeously presented. The variations on rhubarb included two poached sticks of rhubarb, some rhubarb sorbet, sauce, and the rhubarb jelly which sat atop a baked vanilla custard, which itself sat atop a rectangle of white chocolate. Beautiful. Rhubarb fans rejoice! (Anyone still remembering my How to Eat project will know just how rhubarb-obsessed the lovely Nigella is). This was a very interesting dessert, cleverly put together, with a thoughtful combination of flavours - a lot cheffier than what I'm used to. The ice-cream was thyme-flavoured, as were the pressed apples. The cubes of apple themselves had a sharp, vinegary taste to them. Overall very well done, but a bit out-there for us. The souffle had a wonderful texture, but was very sweet (I'm starting to think that this is the way souffles are meant to be, as I can almost never find one that's not too sweet for my taste). The honey ice-cream was gorgeous, and I'd love to re-create it at home one day. Su had the full-sized version of this dessert, which came with strongly spicd poached quinces and candied cumquats. The chocolate dessert (I'm sorry I can't remember exactly what it is..). It included an oblong of dark chocolate mousse (perhaps a pave? ), with intensely dark chocolate sorbet. Despite a few small issues with the service, we had a good time and enjoyed the food at The Botanical. They do breakfasts too, which I've heard are very good.